Classrooms and conference rooms. 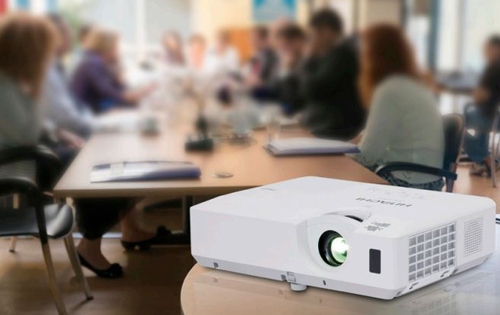 The CP-X25LWN is for lights-on viewing in classrooms and conference rooms thanks to video processing designed to improve image quality with ambient light. It also features a 10,000-hour lamp life at full brightness, backed up by a 5-year/10,000-hour lamp warranty. Excellent connectivity, ability to send content over a LAN, and a free app for connecting to mobile devices. Traveling presenters. Light weight (under 7 lbs) make the CP-X25LWN easy for traveling tutors and sales people. Leave the PC at home -- read files from USB memory keys and connect to mobile devices. Physical attributes. All ports are on the back panel, taking up the left two thirds of the panel as viewed from behind with one of the intake vents taking up the rightmost third. The second intake vent is on the front half of the left side panel, with the exhaust vent covering roughly the front half of the right side panel. The security bar is near the lower left corner of the back panel, the power connector is just to the right of that, and the Kensington lock slot is on the lower right of the area with the ports, just to the left of the rear-panel intake vent. Controls are on the top, near the back. Low Lamp Mode. Unlike most projectors, the CP-X25LWN doesn't offer an second, dimmer lamp mode that increases lamp life. Instead it offers a 10,000-hour lamp life at full brightness backed up by the extraordinary long 5-year, 10,000-hour warranty for the lamp. Presentation Optimized Lumens. Thanks to the three-chip LCD design, which guarantees matching white and color brightness, all of the presets deliver acceptable color quality for most presentations. However some colors in the brightest modes--Daytime, Photo, and Board(Black)--are lower in saturation, and skin tones in some photos have green or blue tints. Adjusting color temperature in Daytime mode delivers better color quality with a brightness of about 2100 lumens. Video Optimized Lumens. For video, you can improve color quality from the default for Cinema mode by adjusting gamma settings while still getting Cinema mode's full brightness, at not quite 1900 lumens. Zoom Lens Effect on Brightness. The 1.2x zoom lens isn't long enough for the lens setting to have a meaningful effect on light output. Brightness Uniformity. The measured 82% brightness uniformity is high enough to make the difference hard to see even with a solid white image. Input Lag. With the default settings, the input lag in all preset modes was 46 to 50 ms.
On-board audio. The 16-watt mono speaker delivers easily enough volume to fill a mid-size room with far better sound quality than most projectors and no significant distortion even at peak volume. Fan Noise. Fan noise for the CP-X25LWN is typical for its combination of size and brightness. Hitachi doesn't publish a rating. High altitude mode, which Hitachi recommends using at 5250 feet or above, is a touch quieter than typical. Throw distance. The 1.2x zoom lens offers some flexibility in throw distance. For a 120" 3:4 image, the range is 12 to 14.5 feet. For the image size you want, the Projection Calculator will give you the throw-distance range. Vertical Offset. The lens offset is designed to work best with the projector on a table or cart, although it's also appropriate for a ceiling mount. At the native 4:3 aspect ratio, the bottom of the image from the test unit was 14% of the image height below the centerline of the lens. This can create a minor problem, with the bottom of the image hitting the table. However, the lens is mounted with the midline enough closer to the top of the case than the bottom that the projector can be more than 2.5 feet from the edge of the table before that issue forces you to tilt the projector up. If you need to tilt or swivel the unit, you can adjust both horizontal and vertical keystone by up to +/- 30 degrees or take advantage of the ability to adjust individual corners and sides, which also lets you correct for barrel and pin-cushion distortion. Hitachi went with the "everything but the kitchen sink" theory of product design with their new CP-X25LWN. While it delivers on core functions like image quality and brightness, its long list of features is what makes it far more than just another 6.8-pound, 2700-lumen XGA projector. Among its primary features is a lamp that will last 10,000 hours, a claim that is backed up by a remarkable 5-year or 10,000 hour warranty on the lamp. And this is 10,000 hours in full brightness mode, not in a reduced brightness eco mode as is more common on competing units. Many users will never need a lamp replacement. For those who do, the cost for the lamp and filter kit is an unusually low $129.95. Beyond being bright enough to throw a 140" image in moderate ambient light, its HDCR processing makes shadow detail stand out far better than typical in ambient light without losing highlights, its Accentualizer processing sharpens the image noticeably and adds subtle shading. Even though its XGA resolution is not ideal for video applications, its HDCR enhanced video picture is engaging enough to immerse oneself in a full length movie. The CP-X25LWN is loaded with connection options which extend to letting you send content over a LAN, from a USB key, or from a mobile device using an MHL or Wi-Fi connection. Setup is easy. Not only is there standard vertical and horizontal keystone correction, but it also provides independent 4-corner geometric adjustments that let you address issues like pin-cushion and barrel distortion. Education applications in particular can benefit from the LAN-related features, including Crestron RoomView support, automated email maintenance alerts, and broadcasts for text messages and audio alerts. With all its strong points, the CP-X25LWN is an impressive beast, a solid value, and an excellent choice for classroom or conference room. 4 Corner keystone applies to flat screens only and used to correct off axis projection. Pincushion and Barrel distortion require spherical corrections. 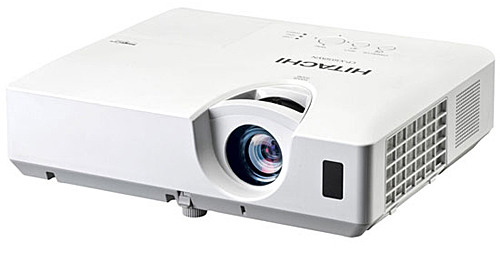 Does this Hitachi Projector support correction of spherical distortions?